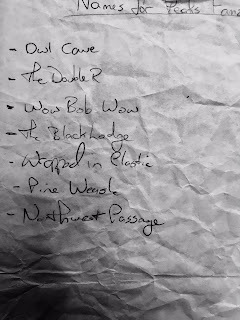 The following is some quick ideas I developed during a recent re-watch of the new Twin Peaks (Parts 1, 2 and some of 3). I am well aware that all of what I've written here could be proven wrong in just a matter of days, but I wanted to put my thoughts down and maybe get a few reactions. In Part 2 of the new Twin Peaks, The Arm says to Cooper: “253” and “time and time again.” Can we assume 253 is a time, as in 2:53? Quite possibly. 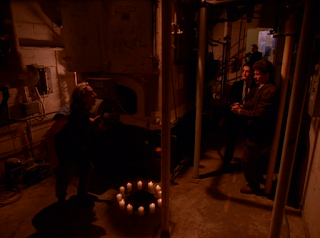 In Part 3, Cooper encounters American Girl in the otherworldly room of the “socket portal.” There, when her watch turns exactly to 2:53, a lamp illuminates on a table next to Cooper, indicating, it would seem, that Cooper’s portal is now accessible. And, indeed, he does travel through the portal and exchange places with Dougie. But what does “time and time again” mean? Is Cooper caught in a time loop? Does he attempt to leave the Red Room over and over again, only to be shunted off to the “socket room” where he experiences 2:53 “time and time again?” This repetitive experience might be illustrated by what happens to Cooper when he appears in the glass box in New York. He seems to undergo a shuffling of sorts, his image shrinking and growing along a vanishing point within the box. Are these shuffled appearances of Cooper “echoes” of earlier visits to the box? Has he already been there many times before, always to end up in the socket room? 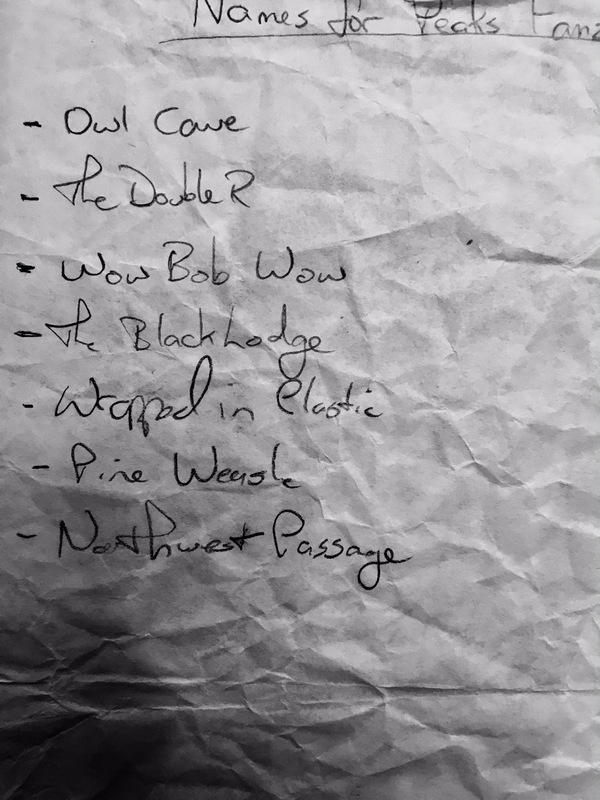 These are just idle speculations, ideas that seem to fit with what little information we have in the first four hours of the new Twin Peaks. 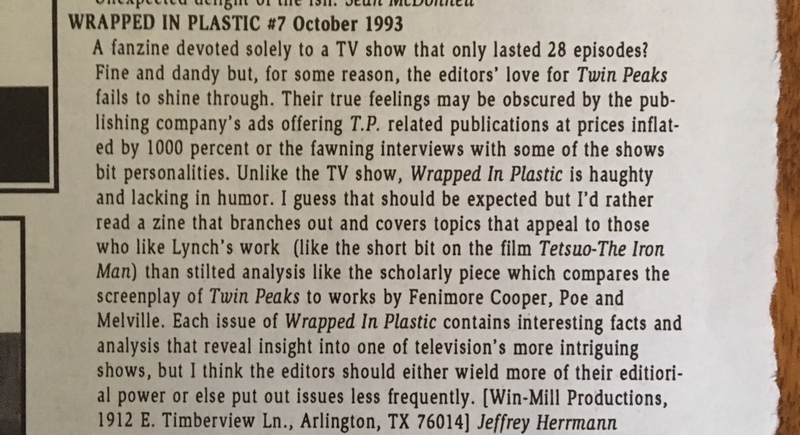 Still, it’s an intriguing scenario: that Cooper has been many times tricked into a manufactured world. (Note that he is referred to as a “dream weaver” by Janey-E (Naomi Watts)). If he is killed there, the Evil Cooper remains at large. But time-loops within the Red Room continually allow Cooper the opportunity to get it right: To exchange places with his doppelganger either by jumping through the curtains just as the Evil Cooper drives by, or by refusing to exit through the electric portal when urged by the American Girl. What if Cooper’s proper exit from the socket room is through the barred metal door? What if the banging he hears on the other side is not a threat but a warning—an attempt to stop Cooper from leaving via the socket? It’s all hard to say, of course. The Dougie scenario so far seems to promise much more for Cooper than a simple parallel existence. And right now, after Part 4, Cooper might be slowly “awakening.” There is evidence that implies he remembers being shot or stabbed (note how he looks at his stomach when the boy, Sonny Jim, appears in the hallway). So who knows? I’ve always liked parsing Twin Peaks and I’m happy to be doing so again. The new show is rich with possibility and it allows for many curious ways to connect the narrative dots we’ve been given so far. 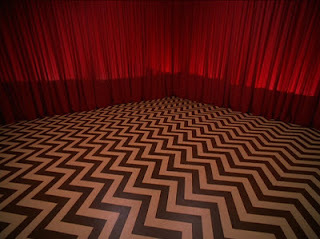 It's undeniable that the Red Room plays an important role in the Twin Peaks saga. 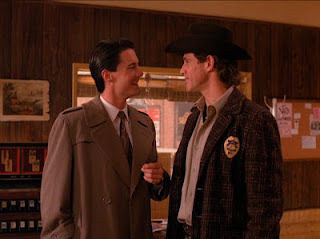 Not only are these scenes some of the most memorable of the series, but the final events of both Fire Walk With Me and (except for a brief epilogue) the television series take place there. 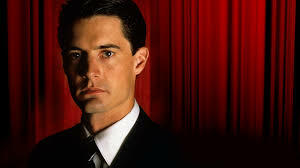 FBI Special Agent Dale Cooper's ability to tap into the secrets and mysteries of the Red Room helps him solve the crime of the murder of Laura Palmer. 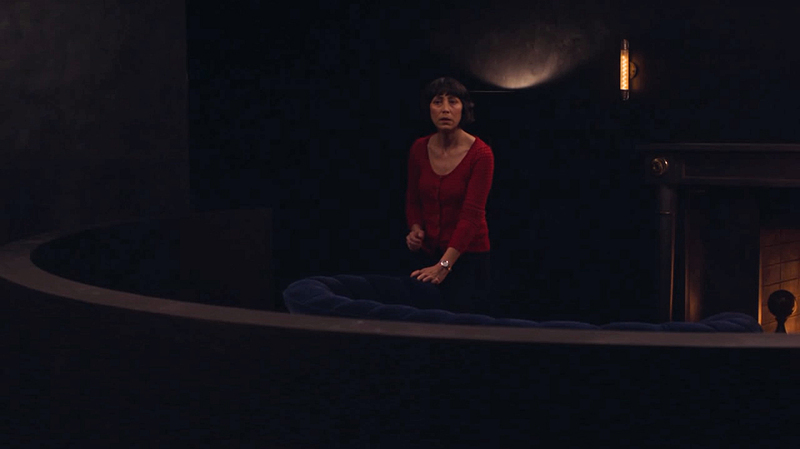 In FWWM, the Red Room is the place in which Laura's angel meets her, allowing Laura finally to experience the peace and joy that eluded her in life. 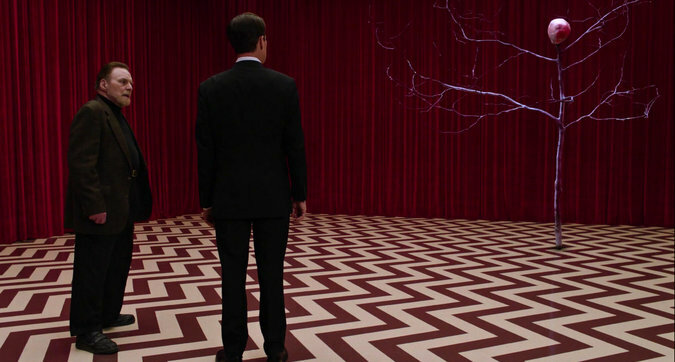 Upon examining the presentations of the Red Room throughout the series and film, however, one notices a difference of interpretation among the show's writers as to the identity and function of this place. 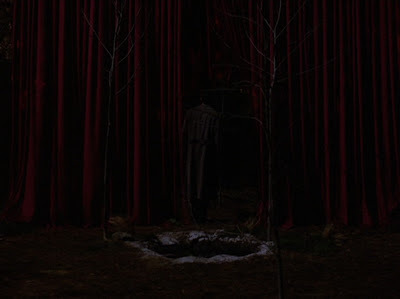 Lynch first committed the Red Room to film in the so-called "European version" of the Twin Peaks pilot in which Lynch ad-libbed an ending that would allow the episode to be presented as a film. In this version, Sarah Palmer remembers seeing the killer hiding at the foot of Laura's bed. Deputy Hawk makes a sketch based on Sarah's description. Meanwhile, Mike, the one-armed man, has information about the killing and calls Cooper, who meets him at the hospital. 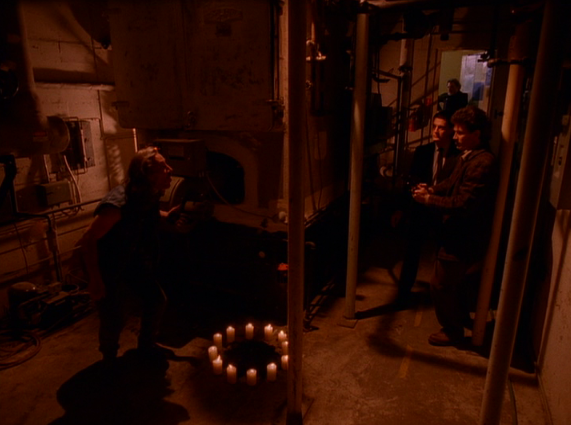 Cooper, Sheriff Truman, and Mike find Killer Bob in the basement. Mike shoots and kills Bob, then mysteriously dies himself. Cooper says, "Make a wish," and a ring of candles blows out. 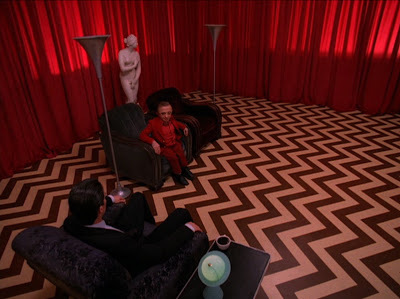 Suddenly it's "25 years later" (as a subtitle on the screen tells us), and Cooper is in the Red Room. The Little Man introduces his "cousin, who looks almost exactly like Laura Palmer," and the footage is virtually identical to what would appear at the end of the second Twin Peaks episode, but re-purposed there as Dale Cooper’s dream. 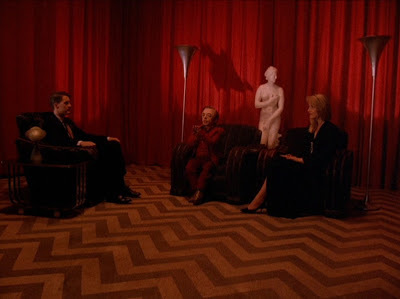 We can only wonder what Lynch was thinking when shooting these Red Room scenes, and what his ideas of the place really were. 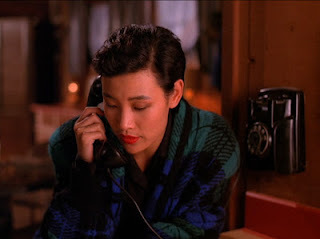 And though written and directed by Lynch, the scenes, as existing in the European edit, are hard to consider as part of the official Twin Peaks canon, falling, as they do, so far outside the television series and FWWM continuity. 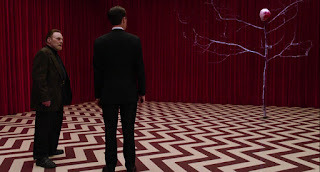 Whatever Lynch intended the Red Room to be in the European edit, the third episode clearly establishes it as a dream-world, a gateway to the subconscious, full of secrets that provide guidance to Cooper and answers to the mystery of his case if only he will utilize them. 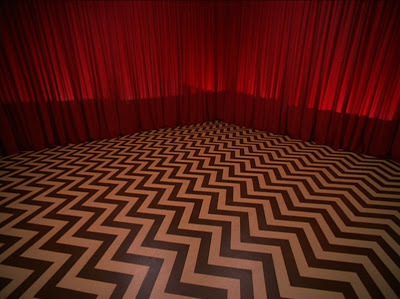 However, when the Red Room appears in the final episode of Twin Peaks, something has changed. As noted above, Lynch went so far as to say that "it was . . . completely and totally wrong." 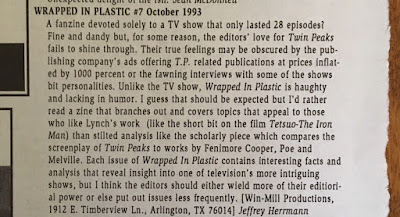 Television is a collaborative medium, and Twin Peaks had two primary co-creators, Lynch and Mark Frost. But Harley Peyton and Robert Engels also contributed significant elements. As the second season progressed, the involvement of Lynch and Frost varied. 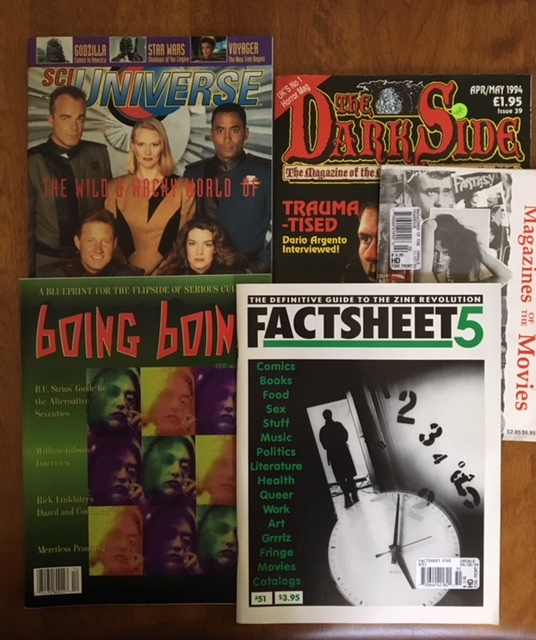 An element like the Red Room--vague and mysterious to begin with, and quite possibly intended to exist only in subjective reality anyway--was bound to experience some change as different writers brought their own interpretations. For Frost, then, the Red Room becomes a place that can be physically entered. 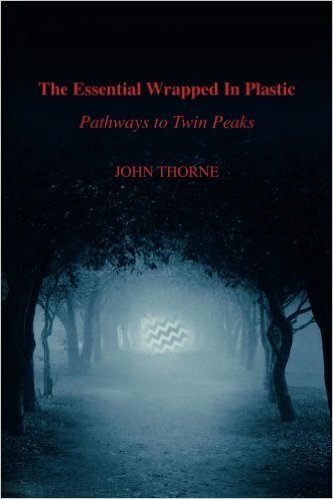 This interpretation would become a critical element of the final episode, in which Dale Cooper leaves this world for the world of the Red Room. But when David Lynch returned to direct the final episode he was not comfortable with what the Red Room had become. Discussing the Frost/Peyton/Engels script for the final episode, Lynch said, "[W]hen it came to The Red Room, it was, in my opinion, completely and totally wrong. Completely and totally wrong. And so I changed that part." (LoL p. 182). 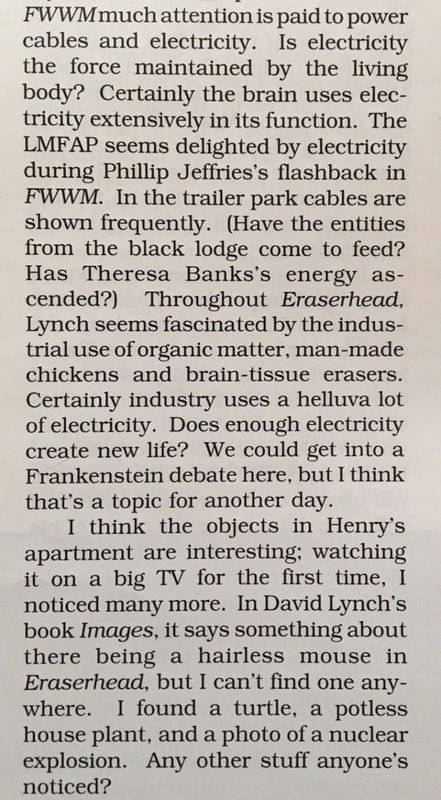 Unfortunately, Lynch does not elaborate, and interviewer Chris Rodley does not press him on the point, so we are left to guess what Lynch was referring to. This is a very important comment. 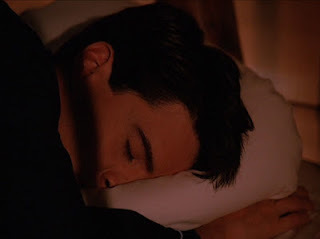 Lynch acknowledges that he and Frost had not been working together on the final run of Twin Peaks episodes, and he admits that a collaborative effort between the two may have resulted in a stronger interpretation of the Red Room. 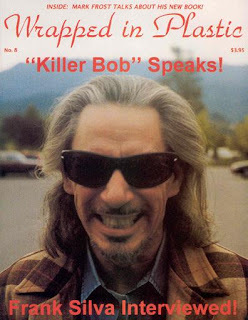 We are now on the cusp of new Twin Peaks. 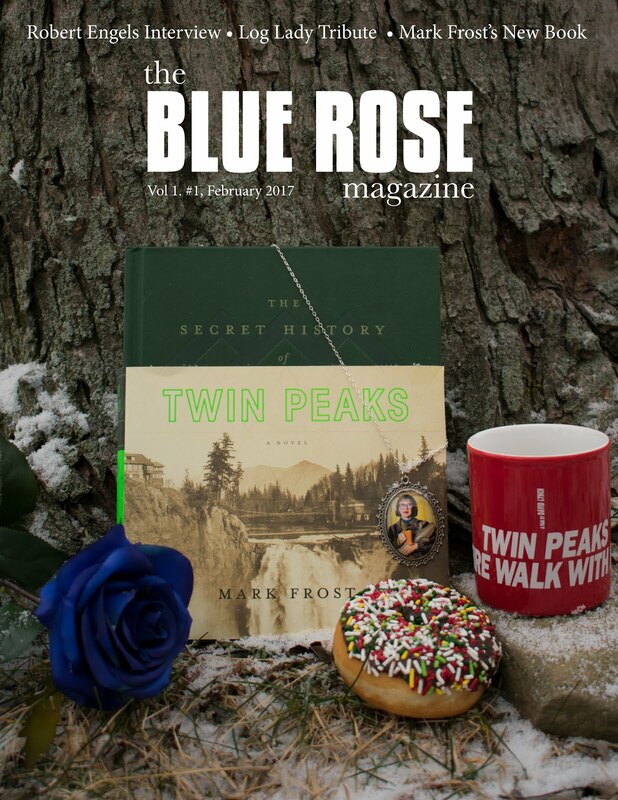 The fact that David Lynch and Mark Frost are creating Twin Peaks together is a cause for celebration. Perhaps we will soon find out how they mutually interpret the Red Room. Will it be a physical place? Will it be a realm of the subconscious? Or will it be something else entirely? On May 21, we may have our first answers. Stay tuned. 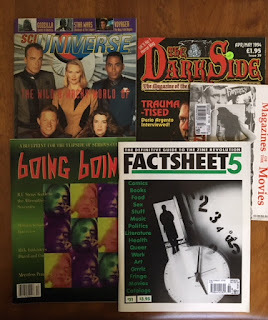 A much, much, longer version of this article first appeared in Wrapped In Plastic 54; it is worth seeking out for the deep analysis of the Red Room it provides. 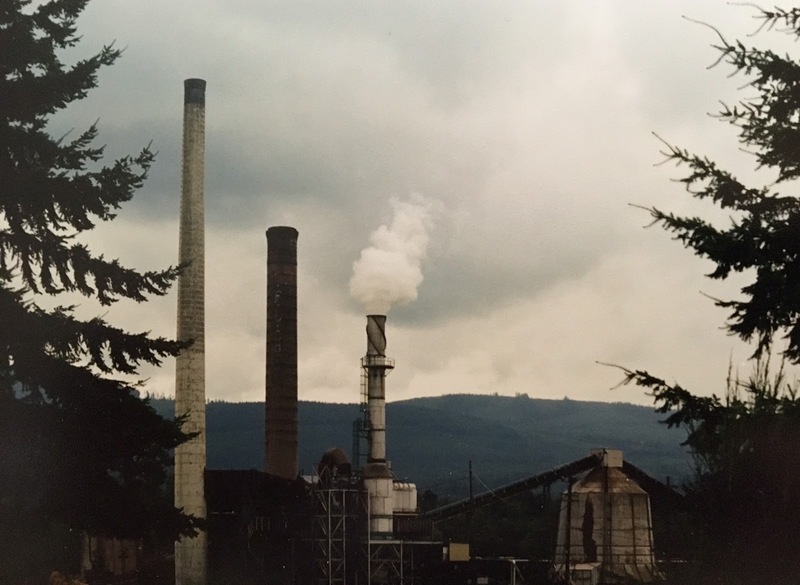 “Once it became the Northwest we just went up there and did a lot of location scouting and found a lot of great, great places. 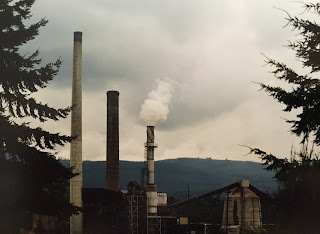 Like the sawmill—that was pretty incredible because it was a beautiful old sawmill. . . . [W]e had maybe four days shooting inside and outside and we were always using those images—the saw blades and stuff.” – David Lynch, (director and co-writer, Twin Peaks pilot), Lynch on Lynch (ed. 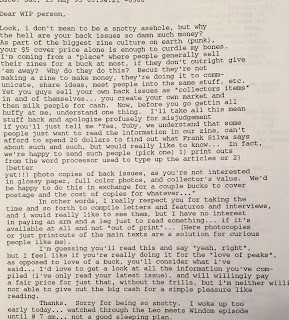 by Chris Rodley), p. 160-161. “One of the first questions people ask is, ‘How did they find you?’ How did they find the Mar-T? 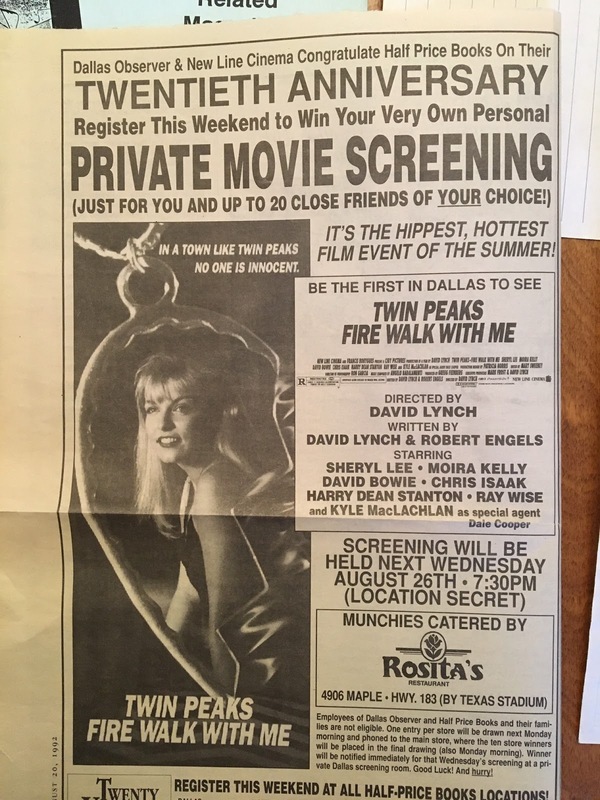 They sent out a location scout in February of 1989. We weren't very busy and I said, ‘You can use it, but we're fixing to do some remodeling.’ But they said, ‘Oh no, don't do anything like that. 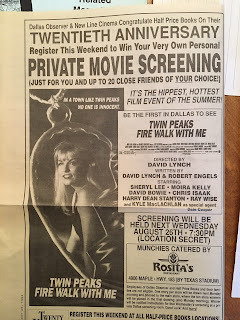 We want it just like it is.’ About two weeks later, they said that David Lynch will be up on the weekend and he'll decide. So they came up and told us they wanted to use it. They came up about the 28th of February and I'd never seen so much equipment. There was about seventy-five people that were working, and there was another hundred that were watching from the outside.” – Pat Cokewell, (former owner of the Mar T Café – a.k.a. “the Double R Diner”), Wrapped in Plastic #7, p. 13. “There’s this story about the Double R Diner. 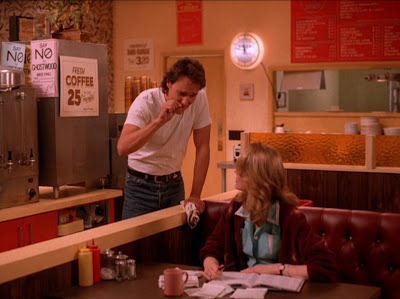 See, the highway used to go through there and the diner was, you know, doing business. And then the big freeway went in and nobody was stopping there. And the owner . . . used to make, like, maybe six pies a day when we got there, if that. After Twin Peaks she was making sixty pies a day! 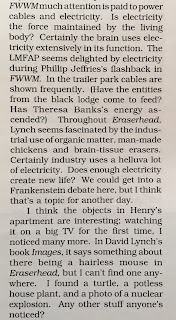 That place is on the map, you know, forever.” – David Lynch, Lynch on Lynch, p. 161. “When we shot [Sheryl Lee] it was cold—I mean, it was so cold. And she lay out there, and then we’d have to take her away, where they had these blankets and heaters set up behind this giant log. So she’d run fifteen and go into this warm little tent and get her body temperature back up, and then go back and shoot. She was a great sport” – David Lynch, Lynch on Lynch, p. 172.